US, 1950, 106 minutes, Colour. Betty Hutton, Howard Keel, Louis Calhern, Keenan Wynn, Edward Arnold, J.Carol Naish, Clinton Sundberg. Annie Get Your Gun was one of the most celebrated of the post-war Broadway musicals. It was a star vehicle for Ethel Merman. And it had a fine collection of songs, music and lyrics by Irving Berlin (Call Me Madam, Blue Skies) with the perennial showstopper, There’s No Business like Show Business. The story is that of Annie Oakley, the famous sharp shooter, portrayed by Barbara Stanwyck in the 1930s biography, Annie Oakley. However, in this version, she comes from the backwoods, wins the shooting competition over the celebrated Frank Butler, is invited to become part of Buffalo Bill’s Travelling Show, scrubs up very nicely and becomes a star attraction to Frank Butler’s annoyance. She travels to Europe with the Show and plays to the royal heads of Europe, including a scene in this film with Queen Victoria. However, she still hankers for Frank Butler and returns home. Buffalo Bill is in debt as is his rival showman, Pawnee Bill (Louis Calhern and Edward Arnold). A merger is proposed but Annie and Frank create difficulties, but Annie is advised to back down and lets Frank Butler win a competition and then she gets her man. 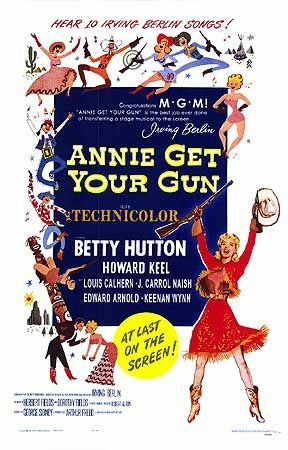 While Howard Keel had appeared in some small dramas before this, Annie Get Your Gun was really his introduction, his first musical, and he was an MGM star from 1950 to 1956 when the musicals stopped. As with other contract players, he also appeared in a number of dramas in comedies. This is really Betty Hutton’s show, when she eagerly took over when Judy Garland became unwell and had to withdraw. In That’s Entertainment, audiences can see Judy Garland performing I’m an Indian Too. The musical has continued to be popular on stage right into the 21st century with quite a number of actresses doing their turn as Annie Oakley, particularly notable being Bernadette Peters. The director of the film is George Sidney, veteran of many musicals including The Harvey Girls, Showboat, Jupiter’s Darling. 1. The stage history of the musical? Ethel Merman and her raucous tradition? The film as a vehicle for Judy Garland? Her withdrawing? Betty Hutton taking over and making the role her own? Later stage versions and continued popularity? 2. Irving Berlin, the strength of his melodies, the strength of his lyrics – straightforward and conversational? Their placement during the film? Contributing to plot and character? 3. The style of MGM musicals in the 1940s and the 1950s? Casts, directors, staging of the songs, costumes and decor, bright and popular? 4. Annie Oakley and the legends? The true story? As a markswoman? The films about her? This version, grubby, from the backwoods, with the kids, selling the quails, her skill at shooting? The hotel manager, arranging for her to compete? Her seeing Frank Butler – and the exaggerated jaw-drop? Winning the competition? Frank Butler’s sour reaction? Her being invited to join Buffalo Bill’s Show? The travel, the kids unlocking the carriage, her scrubbing up well, in supporting roles, the plan of Charlie and Buffalo Bill, the poster and her being happy, Frank Butler not being happy? The surprise of her performance on horseback, Frank’s turning her down? The success, European trip, with Queen Victoria, all the medals, returning home? Kissing Frank, the rivalry with ‘anything you can do…’. Spoiling the potential merger between Buffalo Bill and Pawnee Bill? Her being persuaded to lose against Frank? But getting him to the altar? The background of the Indians, Sitting Bull and the ritual of making her his daughter? 5. Frank Butler, vain, a good marksman, meeting Annie, in love, but a bad loser, his irritation at her poster, at her performance? Joining Pawnee Bill? Reunited to the end, after the rivalry and Annie losing to him? 6. The popularity of the travelling shows, the big audiences, all over the US, to Europe, the crowned heads, the medals and awards? Queen Victoria? 7. The presence of the Indians - looking at these sequences in retrospect, segregation, in the car, the comments on their manners, lining up for food…? 8. Sitting Bull, his liking Annie, organising the ritual for her to become his daughter? His investing in the combined show? 9. Charlie, tough, managing, critical of Frank, supporting Annie, his work with Buffalo Bill? 10. The spectacle, costumes and decor, the lavish show, the action? 12. Popular in the 1950s – and still going?